Icon Audio revives the spirit of Leak | What Hi-Fi? Here's something a little bit retro – the new Icon Audio Stereo 20PP valve amplifier, based on a 1955 design by British hi-fi company H J Leak, the Stereo 20. While the original Stereo 20 can now change hands among collectors for up to £1200, the Stereo 20PP costs £500. The new Class A variant is designed for use in smaller rooms, and with loudspeakers that do not require a large amount of power. 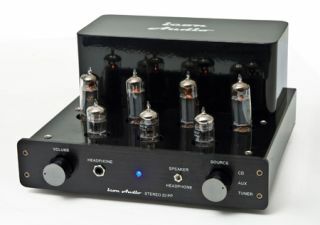 It has Mullard EL84 output valves, ECC83/ECC82 double triode valves, Solen audio capacitors, Teflon-insulated silver-plated wiring and gold-plated input and speaker terminals. Claimed power output is 15W per channel. A headphone amplifier and Perspex valve cover are included as standard. The amp can be supplied in all-triode form on request.